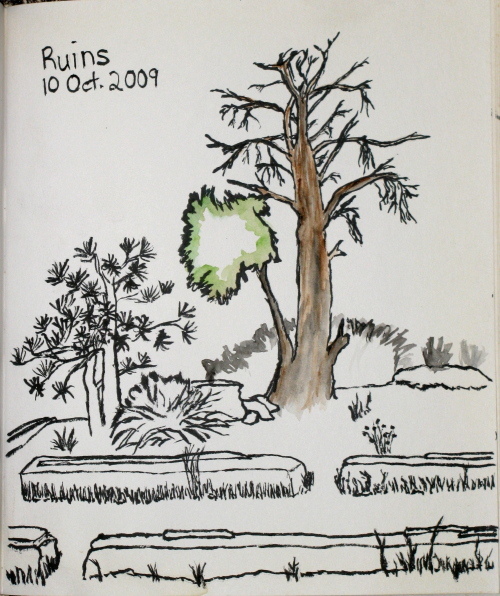 No real hiking in December, but I did go out to the Wilcox Property (or, apparently properly called Douglas Family Preserve) and sketch in a couple spots, as well as take photos that could become more sketches. 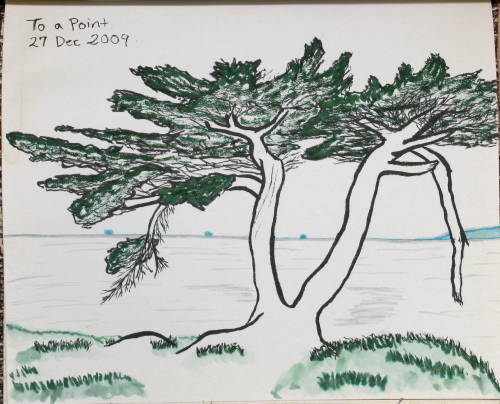 The cedar at the end of the point. The view of the Brown Pelican from by that cedar. Somewhere in the center along one of the old roads. 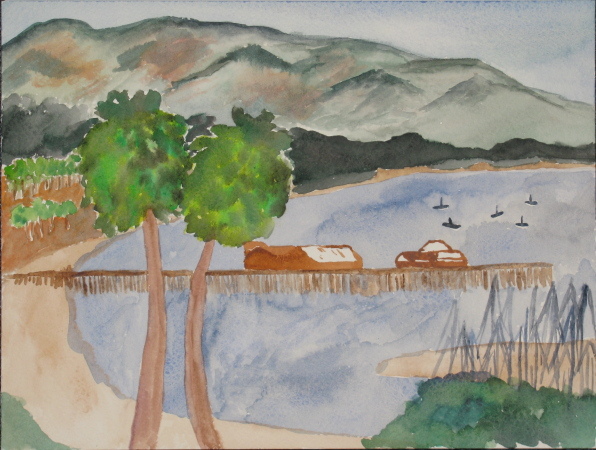 Some attempts at art in open spaces. 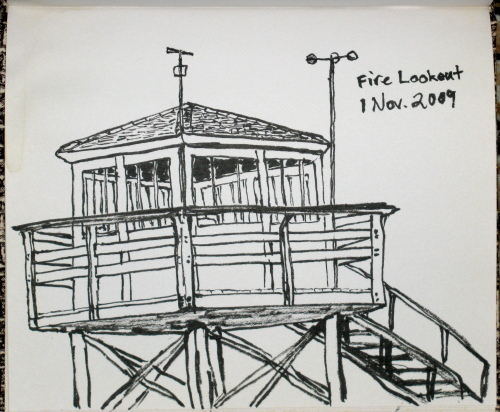 The fire lookout that has been moved to Henninger Flat. Painted up at SBCC while trying to encourage mom to have at it too. 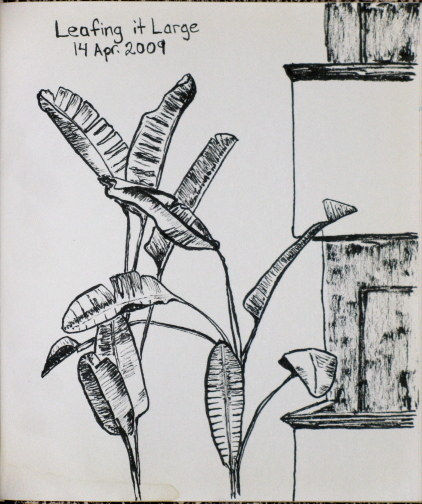 She used to draw a bit, but worries it isn't good. This was a quick hike late in the day before driving back home. Warner Valley is along a road that goes into the park and stops a bit east of the main road. A sign in Chester pointed the way to the park road. Keeping left, then right brought me to a small parking lot for the Pacific Crest Trail well after the road had turned to gravel. The trail had many junctions but was well signed. Someone had written in "Boiling Lake" on the one sign post that forgot to mention it. The lake itself was a very easy 1.5 mile up the trail which has a loop around it. It's so easy, or maybe the land so cold this time of year, that I was quite comfortable in my thermals the whole way up to the thermal feature. The road actually goes up to a ranch just past the trailhead. I followed the PCT along through some sloshy grasses and over a small but fast stream to a footbridge across a small but fast river. 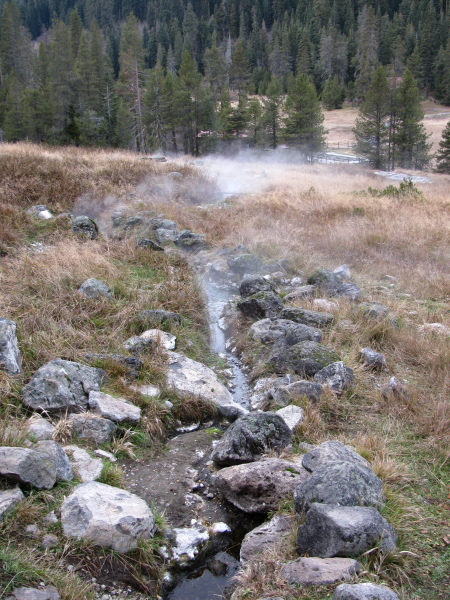 Above the river, looking down the trail, steam could be seen rising from the grasses. 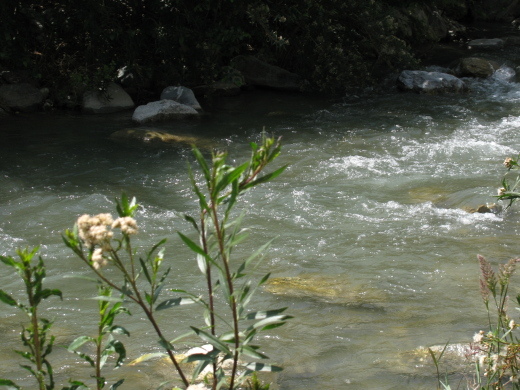 The trail passes along what appears the be the head of a hot spring that is flowing down to where the ranch is though on the other side of the river. Steam rising from a tiny stream bed sourced by a hot spring near my feet and headed on down in the direction of a local ranch. I came to a sign marking the trail for the loop around the lake and took it even though no lake was yet visible. It turned out there were two places on that side of the lake to turn off for the loop, the second much closer to the lake. I quickly came upon it anyway. Some bits of the land around the lake take of a funny shape and color. The trail I took avoided walking too near to this, which may or may not be particularly stable. I drove around to the far side of the mountain the long way around because the road was closed through the park. The north side of the park doesn't have quite as many features to look at even though the road isn't closed until about 10 miles after the entrance station. It goes up to a parking lot in the Devastated Area, so called for having been destroyed in the most recent eruption. There is a picnic area and small loop with interpretive trail around the various lava rocks that came from the mountain when it blew. The north side of the mountain and the land that was cleared by the 1915 eruptions. These are pictures of the lake ice, which I thought was pretty cool with all its variation, but maybe I just don't see a lot of lake ice. 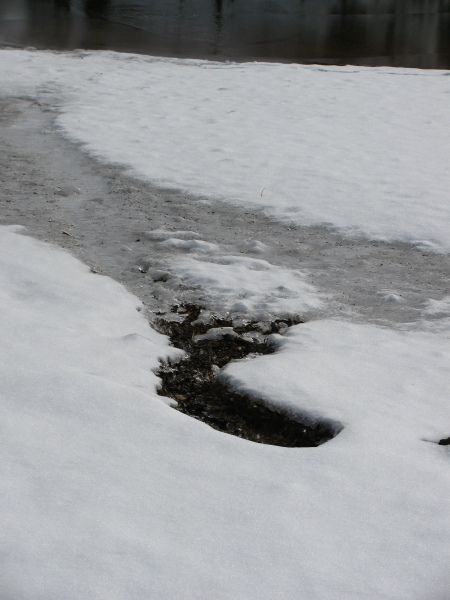 Another look at a small stream of water coming into the lake. 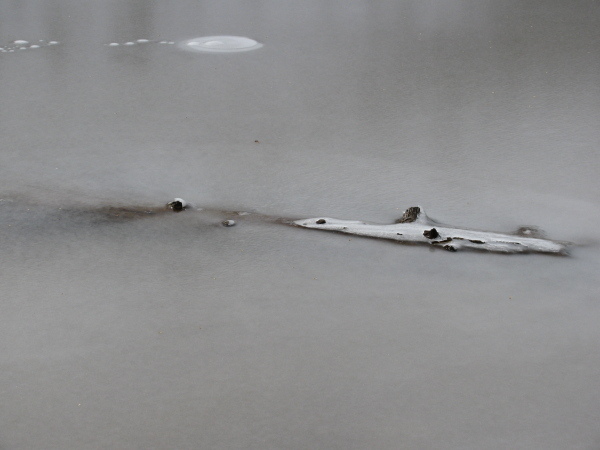 A log frozen into the lake and further on, some strange bubbles. I headed up to Lassen to see what I could see. I have not been for quite some time. Being a wintry time, the mountain was covered with snow. The southernmost mountain of the Cascades, Mt. 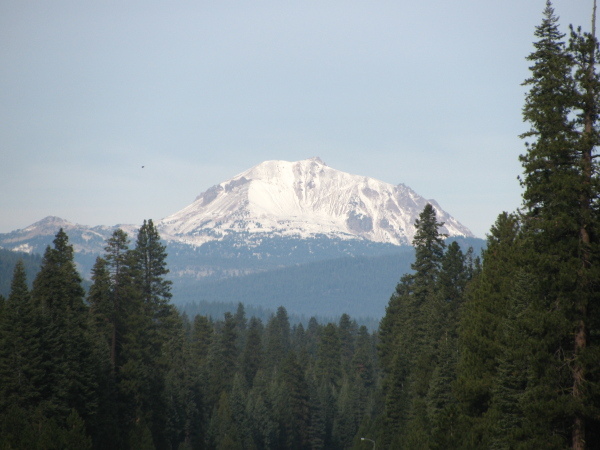 Lassen, viewed from the road on the way up to the park but still quite a ways off. 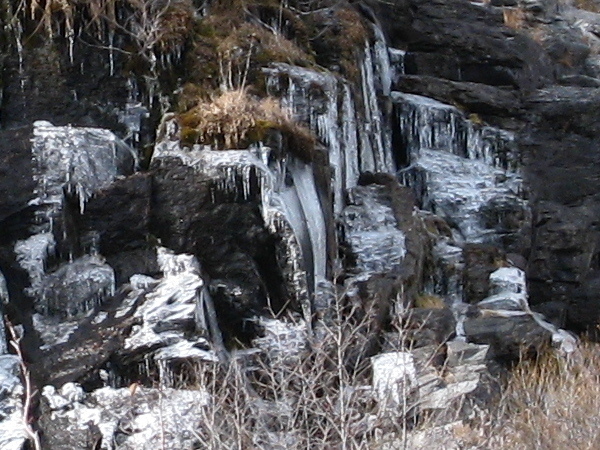 A dribble of water along the roadside in the park has turned into a frozen waterfall with some water still flowing. 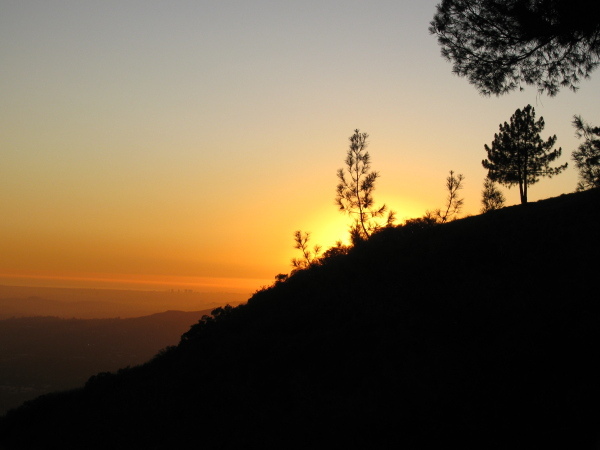 I decided to have an afternoon/evening hike up to Henninger Flats for sunset and drawing and such. There are claims that they are rebuilding the roadway, but it was supposed to start in October and not finish until April or so next year. I didn't check the bottom slide area. 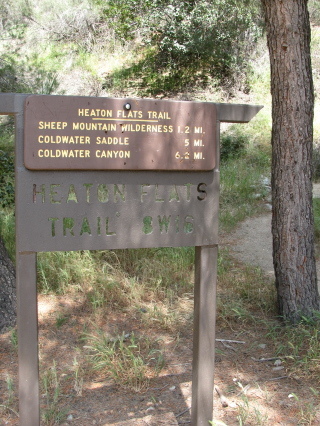 I parked along Altadena, as usual, and proceeded down and over the wash area to the start of the horse trail to the road. The horse trail has a little bit of shade, especially at the bottom, which was nice when starting a little after 3PM with the temperature somewhere a smidgen below 90F. It looks like some repairs have been completed, though. There was no need to snake about the fallen debris near the top of the hike on this go. The roadway was all a smooth and easy hike. I got to the top with about half an hour to sunset. 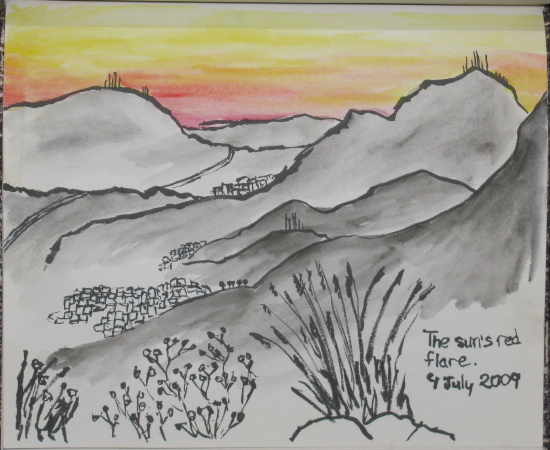 Since I've already done a sunset picture during a previous hike, I opted to sketch the transplanted fire watch tower instead. This left me not entirely in the right place for watching the sunset since the flats themselves are a little hallow in the mountain. About 20 minutes still to sunset but the colors are starting to pick up and the sun is already behind the local chunks of land. The tree up on Echo Mountain. Looking over the Salton Sea while in Joshua Tree. Finally, we stopped for another hike of not too great length. 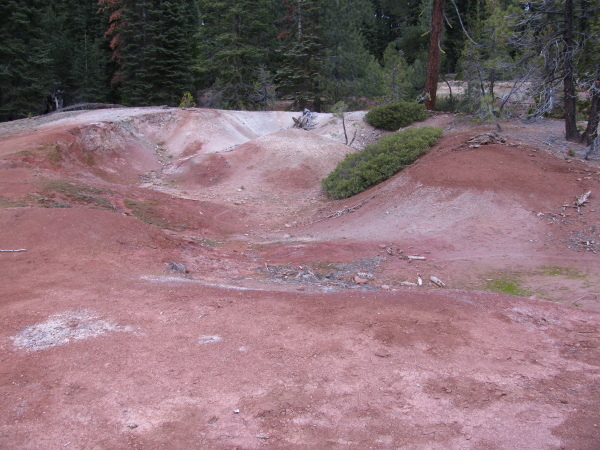 This loop started at Cottonwood Spring and wound around to Mastodon Mine by way of Mastodon Peak. We didn't quite see the mastodon in the peak, but we saw many other shapes in the rocks. 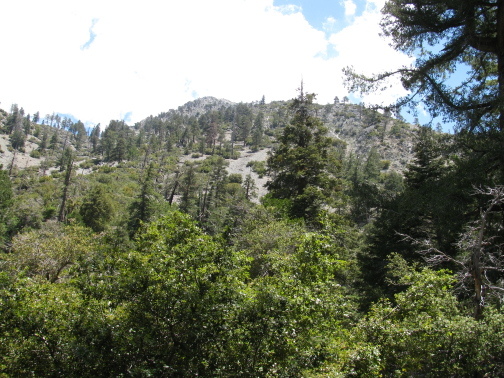 This hike wasn't quite so hot as the one in the morning but is at a higher elevation. 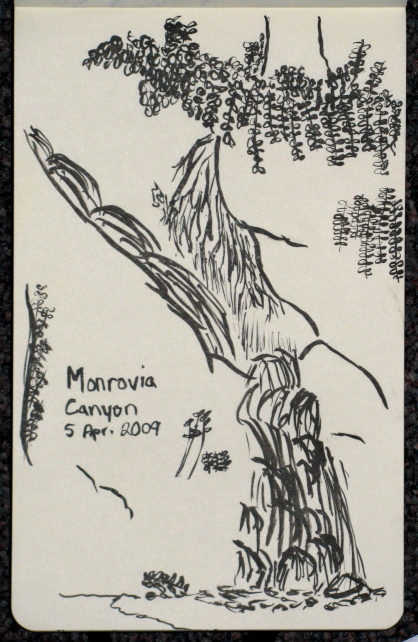 We headed out into the desert by way of Cottonwood spring. This is a spring with quite prominent, non-palm trees. 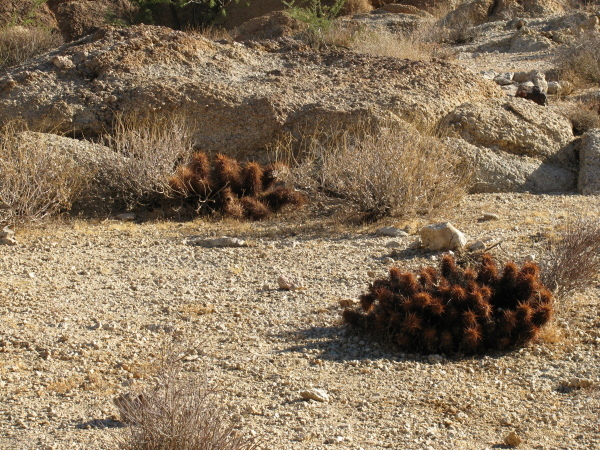 Along the road as the deserts change and the frequency of particular cacti changes, there is a little educational loop through a dense patch of cholla cactus. It turned out these were the delightfully wicked narrow spiny things I'd spotted at that first stop and thought were interesting enough to photograph with the Joshua trees. They didn't look very healthy at that first stop. A few at the second stop looked a little better. 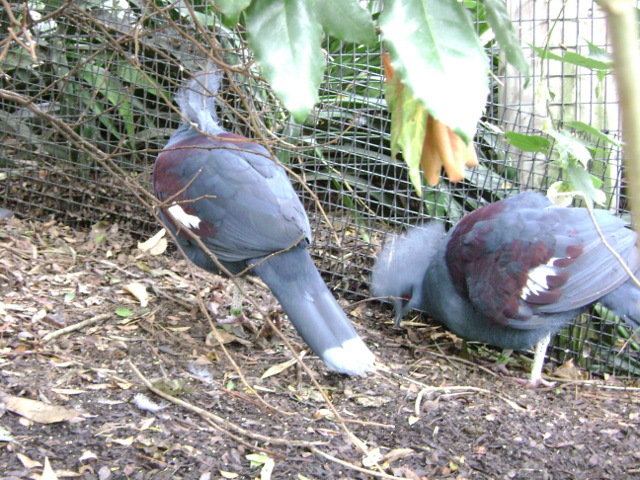 In the "garden", they looked very happy and healthy. 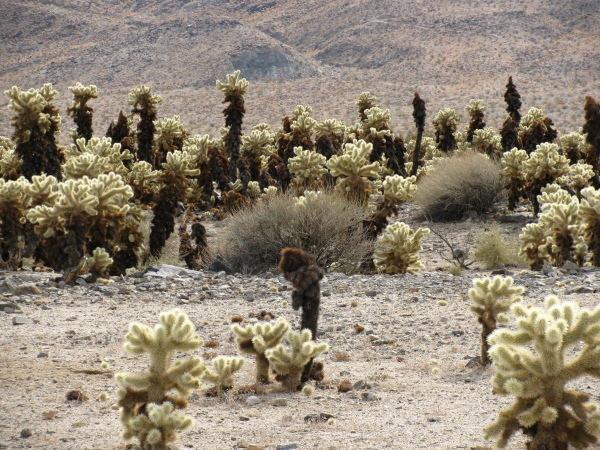 The cholla cacti were very dense on the patch of land designated as the garden. 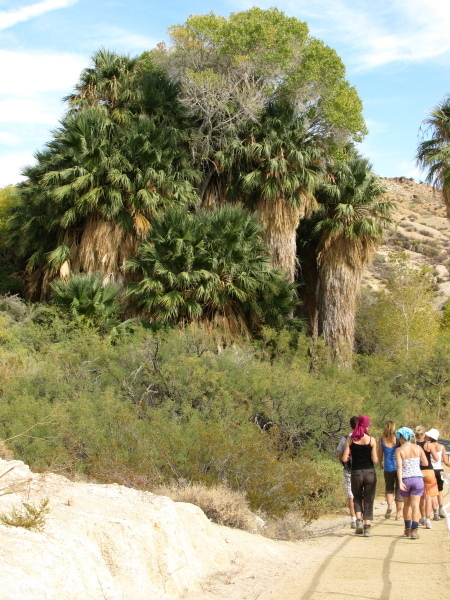 For a morning hike, we went out to see an oasis full of actual desert oasis palm trees. I suppose someone counted them at one point, or at least the ones over a certain size, and found 49 to give the name. We started out maybe a little late, I think it was about 10AM already. It was hot! Hot, I tell you! So hot, the plants aren't green. Some cacti in the sun. I guess these little ones like to have neighbors, or maybe just lots of arms. After our hike, we went to Keys view, a popular spot for watching the sunset. This is just an overlook, there is no hike up. Out to the southeast, the Salton Sea is clearly visible. Some of our crew watching the sunset. After lunch, we rattled down the single lane dirt track to the Lost Horse Mine trailhead past the gate that closes at sunset. 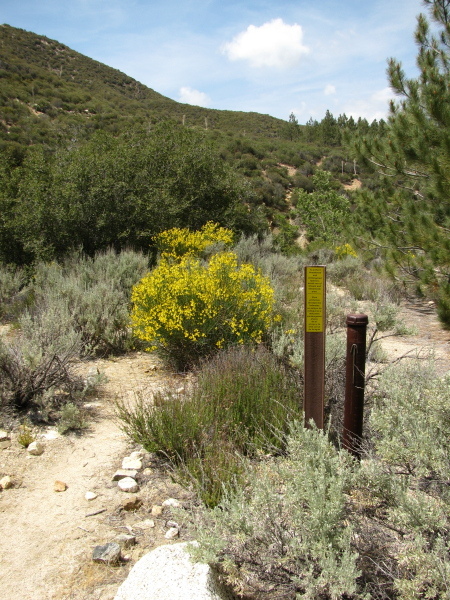 The trail winds upward along an old dirt track to the mine in about two miles and continues around in a somewhat longer loop if desired. Signs indicated a fire had been through the year before although we didn't see any natural signs of recent burn. 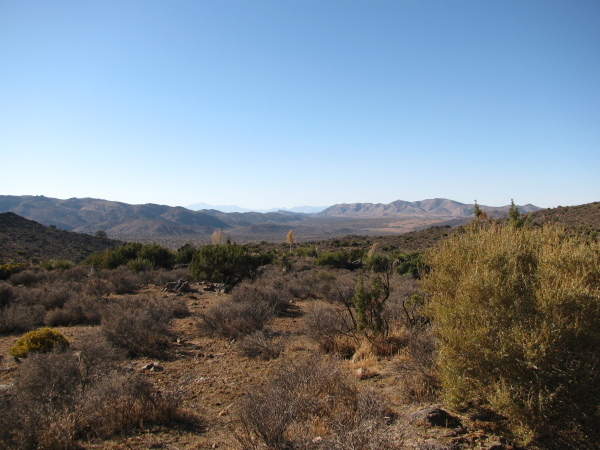 Looking out over the desert to the distant mountains near the start of the trail. 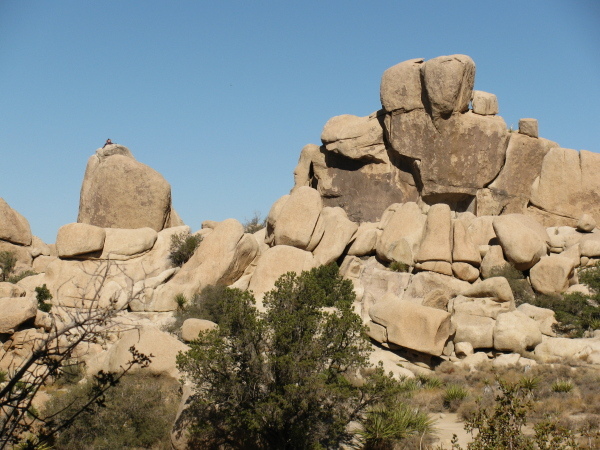 Hidden valley once served as a natural corral, according to the signs. 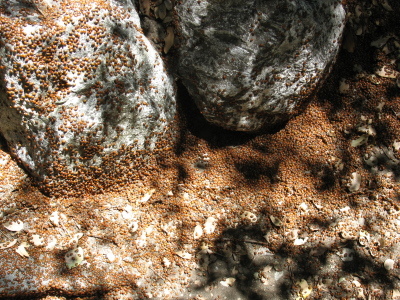 The rocks completely surrounded the area and dynamite was used originally to open up a route to the inside. Now it is absolutely crawling with rock climbers. The inside serves as a nature trail with many informative signs telling much basic information about the flora and fauna of the area. There was even some information here and there about today's most prevalent fauna, the weekend rock climber. 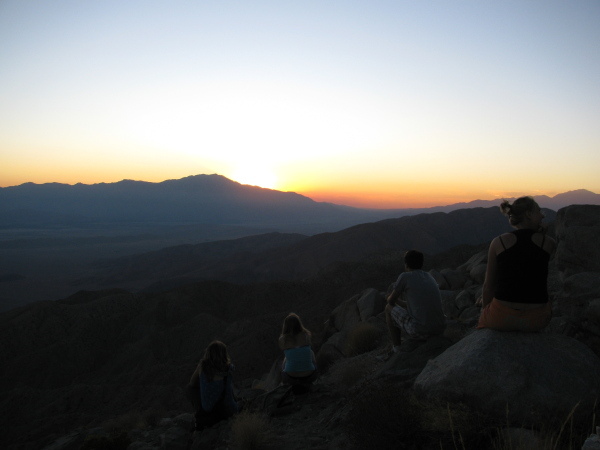 A crew of folk, mostly international students, were going off to Joshua Tree to look about the place and I managed to go along with them. 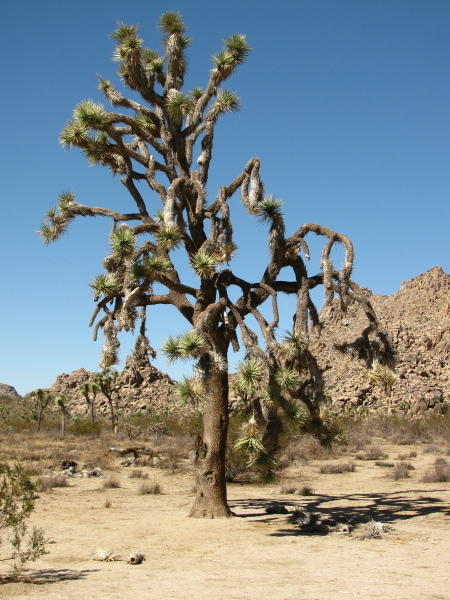 Once there, we quickly found a Joshua Tree to marvel at. 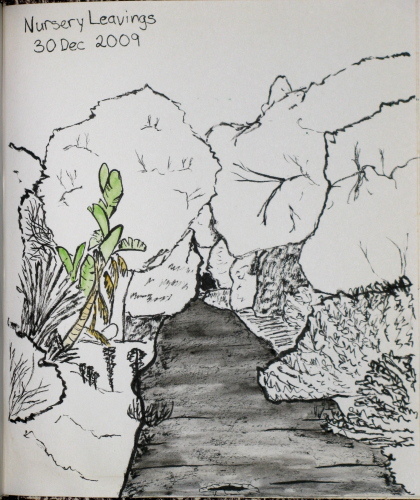 Also some other plant life. A very large specimen of Joshua tree, which is some sort of yucca and not a tree at all. 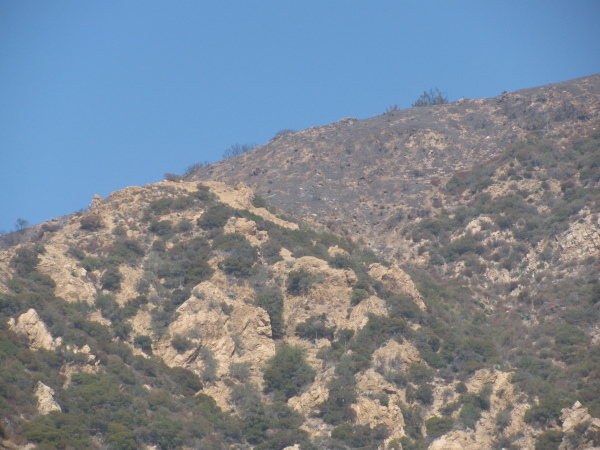 On the first of October, they opened up a few unburned areas in the southern section of the Angeles National Forest. One section is the piece right behind me at the top of Lake. The trail itself isn't actually in the forest until some time just before Echo Mountain but there is no sign so it's difficult to tell exactly. I decided to hike up by Castle Canyon again. 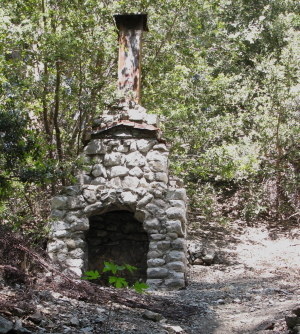 The fire road behind the pavilion at Inspiration Point marked the boundary of the open area and, in that immediate area, the burn. 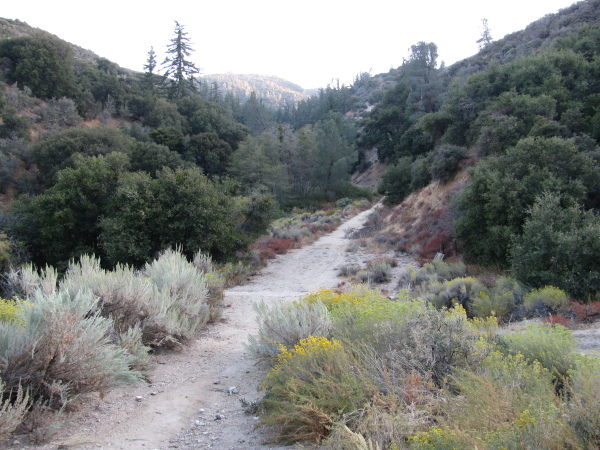 After climbing up, I would explore a little by going down the fire road and then taking one of the other trails back down to Echo Mountain. On the way up, very little burn could be seen. There was a small spot of something that had peeked over the edge of the ridge. The further mountains could be grey with ash or grey with distance. Going up Castle Canyon, I found the bay I had gathered leaves from last year are still quite safe although the flavor of them isn't as good this year. Toward the top, I spotted the first bit of burn. 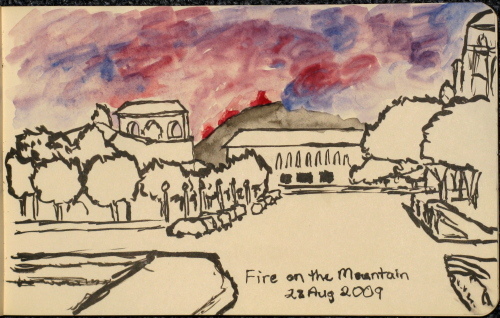 Eventually, the height afforded views of the mountains behind showing more burn area. There isn't much to burn on this side of the mountains. A little bit went up anyway. The mountains in the distance are grey, but the mountains in the distance are always grey eventually. With half the southern section of the Angeles Forest burned and all of it closed, it seemed a good time to go exploring in the smaller northern section of the forest. 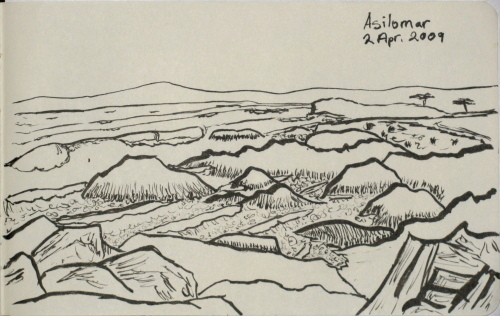 Although small sections of the southern section were opened up just before this, I kept to the plan and found something on the desert side of the mountains. 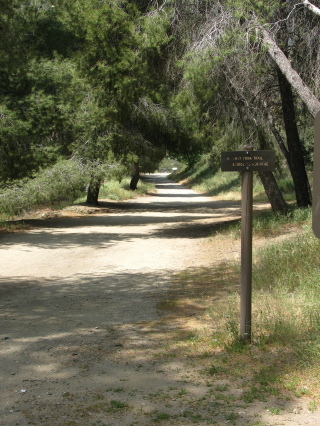 The instructions in Afoot and Afield in Los Angeles County were a little off, so trying to find a small campground off a short dirt road didn't work on the first try. The road to Upper Shake, which the loop goes through, was very shortly after and I was expecting the lower campground to be around it but didn't see anything promising. Turns out the road doesn't like signs, except the one at the bottom. Promising turn offs were unsigned and sometimes locked. The only signs were the occasional "not maintained for low clearance vehicles" which sometimes marked a section on one side and not the other. I found my way back to the road I'd come in on without seeing a campground. The forest map does show a short dirt road coming out a little short of the one I'd gone up that has a trail headed out the end of it. Trying again, I looked very closely for any indication of an old dirt road headed south and found one, so parked. The start of the dirt road was overgrown. A twisted gate lay on the side of the post it used to lock to and two more posts were set between the posts, but beyond was an unmistakable wide, flat, and gravelly roadbed. In sight, a sign board lay against its supports, anything that had once been on it completely removed by time. Following that found a campground of sorts in that there was a two seated pit toilet so little used it had lost its stink with a single area suitable for a campsite near it. At the far end of the campground, if you can say that about a campground with one site, was a post declaring that here was a trail and these are the people who are allowed to pass on it. The road into the campground, no longer accessible from the main road by vehicle. We hiked up to Echo Mountain to watch the fireworks. In this case, "we" is a group of 12 people I mostly don't know who are mostly in Abbie's boyfriend's lab. We met around 4:30PM to head up the trail, probably getting started around 5PM. Today has been hot and humid and we were quite hot going up. 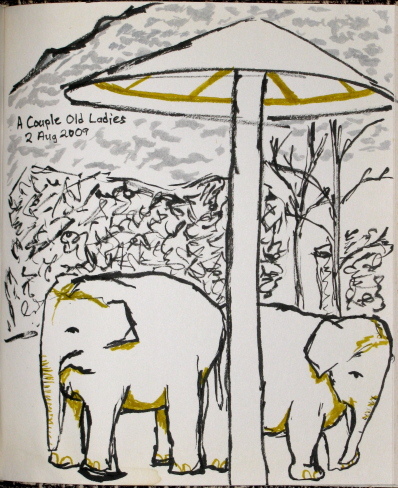 Eventually we were stopping for every bit of shade we could find. We ended up one of the first groups up of those aiming to see fireworks. Most people came as it was getting dark, but we all got to watch the sunset and look around the place in the light. As the day was humid, visibility wasn't great. This manifested itself mostly in a layer of dingy air over the cities, but it didn't go up very high. 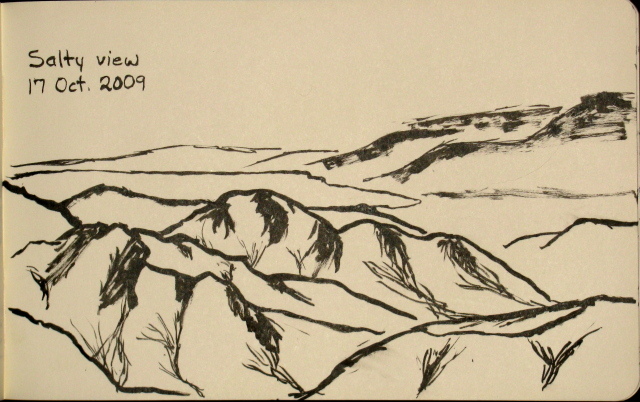 The valleys were quite invisible, but mountains sticking up out of it from time to time seemed perfectly clear. As the sun faded and the lights went on the distant lights became just a uniform smearing of bright. Fireworks popped up everywhere. For the most part they were actually hard to see nearby because the city lights were just as bright. Some shows were backed by nearby mountains so easy to see. The Rose Bowl show was not bad to see, and was the main object of attention for the crowd of people also on the mountain top. More distant shows were easier to see because they also were less likely to seem set against ground lighting. To some extent it was a strange experience in that we could hear the booms but they were all so far away that the firework that generated the boom was only smoke by the time it could be heard. I rather liked the fireworks over the random spots that were in the area so distant the lights had become a uniform blur from the heavy air. The largest of these were the only ones we could see. 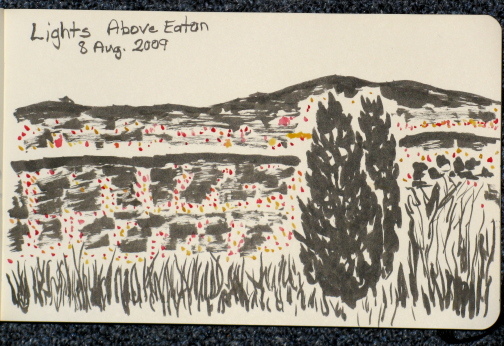 They popped up sharp in that field without clarity rising far above the indistinguishable ground. 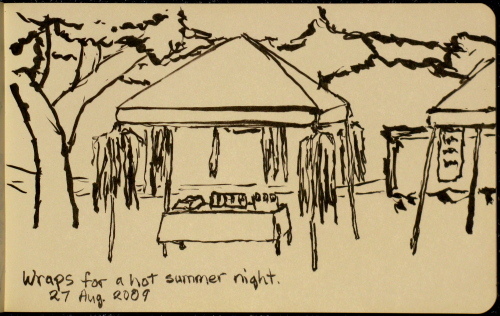 Sketches in the out-of-doors for the month. There's free moments after lunch when conferencing at Asilomar. Another little trek up to the little waterfall. 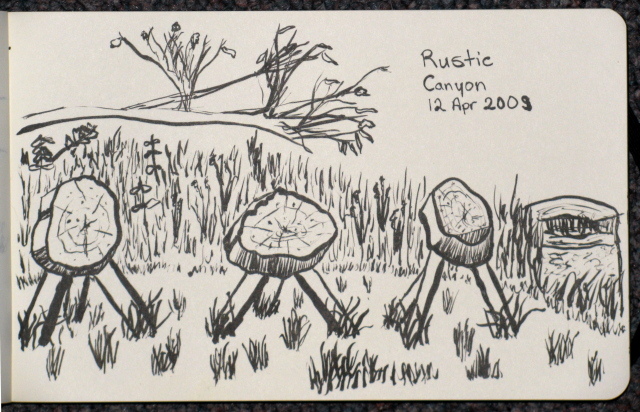 Rustic Canyon is the home of many things, including a Boy Scout Camp. All the way out into the yard. 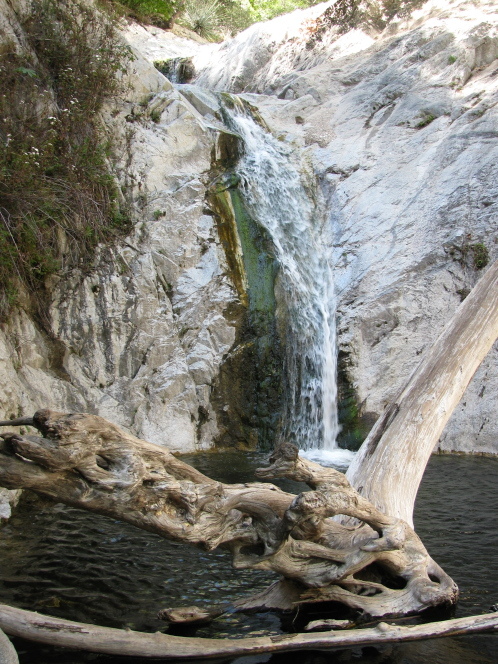 Switzer Falls is found just a short way up highway 2, the first stop past the turnoff to the old highway to Lancaster. We found a spot down by the picnic area, so didn't have to hike down the road. 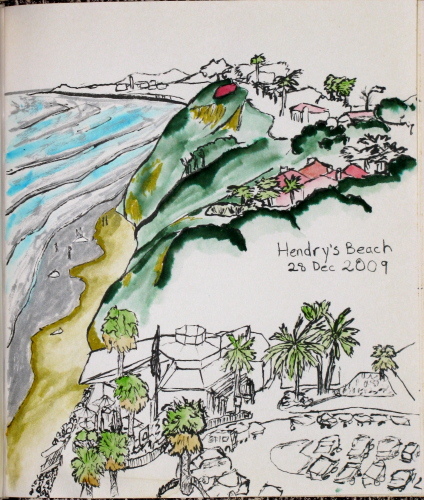 It's a very popular spot and there often are no places anywhere. 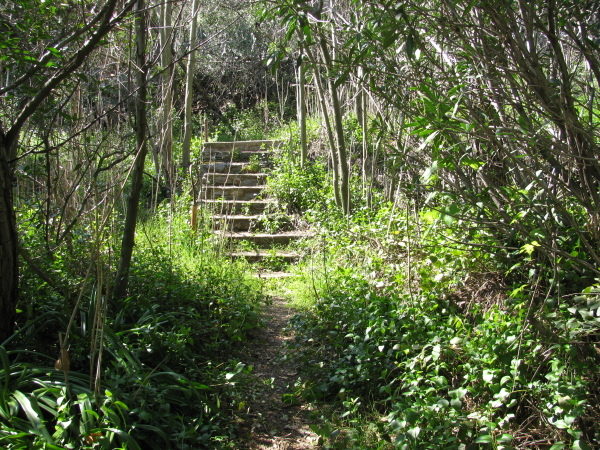 The trail heads downhill with many crossings over the creek. The water was low, so crossings were easy with many many rocks to choose from. It isn't always like that. There is a campground about halfway down as the canyon narrows tightly heading into a few waterfalls, cascades, and rapids. There the trail stays high passing a few scary cliff edges. 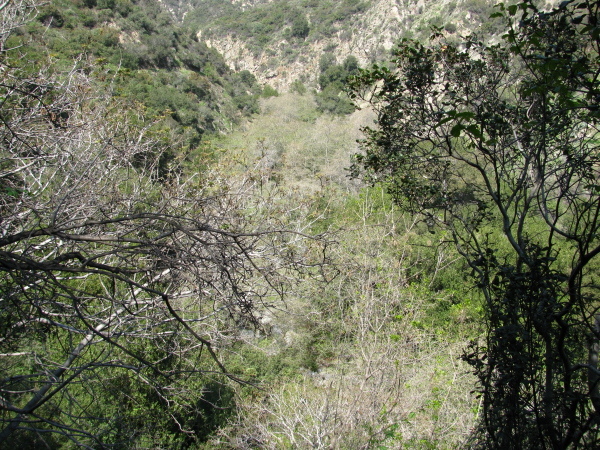 Eventually it splits with the long trek to JPL on the right and a downhill sprint to the bottom of the tight canyon on the left. Then there's just a few more crossings to get to the bottom of the waterfall that is accessible. The waterfall, which has a bit of a cascade character to it and is only about 25 feet high. The tree has always been there when I went, the first time quite a few years ago, and always looks the same. This isn't the tallest falls in the narrowing above it, just the accessible one. I was tasked with finding a hike again for the day. This one should be "about three miles" which meant six miles total. I found one that was six miles where most of that was a loop going out of Will Rogers State Park. It seems to be a popular place for Easter with egg hunts adding to the usual soccer game traffic. The games we saw looked like they're probably a city league rather than a bunch of kids. We poked our heads into the barn and outside of it are buried a couple of ol' Will's favorite ponies, one for polo and one for roping. The old polo fields were today's soccer fields. Then we hiked up the loop to the local Inspiration point. We hadn't figured out which trail we were coming back along so thought going up that it didn't matter which way we took that loop. Turned out if we'd looked more carefully we'd have seen the arrow on the edge saying "to Rustic Canyon" and would have known better. We did the loop the easy way which was the wrong way according to the trip write-up we were going by. 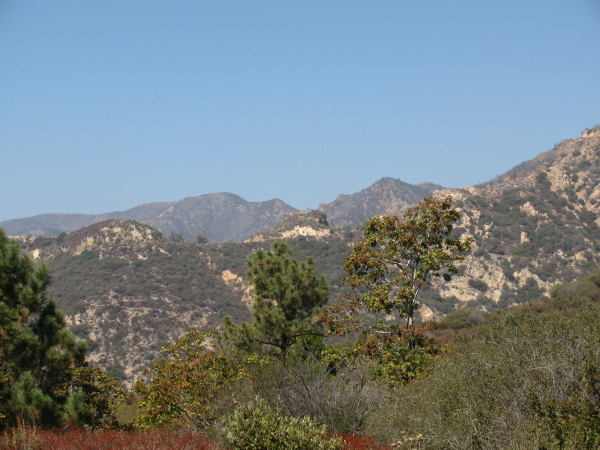 We found our way onto the Backbone trail which actually makes a third route back to the parking lot through the middle but we headed further out and into Topanga State Park. The trail followed up along the ridge for some good views as promised except that the air was a little thick. There was a bridge and soon the top of a peak and then, a quarter mile more or so, the unsigned trail heading down sometimes at a rather breakneck pace and we were happy not to be coming up it. At the bottom was a rather ramshackle old house enthusiastically fenced at one point and in only slightly better shape than the road down to it (which was impassible by vehicle). We turned up the trail for the "better part" of the hike. The stream was dry even though I'd heard water coming down something while hiking down. We got to the Boy Scout camp at the end of the trail and ate lunch. They say the trail doesn't go through but there's supposed to be a fire road out the other side and someone clearly can drive it. At the end of the trail, or so the sign would have you believe, is a Boy Scout camp. Next to this archery range is a shooting range. The air was loud with birdsong while the camp was quite abandoned. We came back down the canyon. After the first building, we found the stream had water. There were many buildings along the way of varying ages and sorts. One was clearly a barn, but others looked quite strange. The trail kept finding bits of old road to travel along but then the road went back up the hillside (I think, I went the other way) and the trail left it for good, becoming even narrower. It was even smaller then. 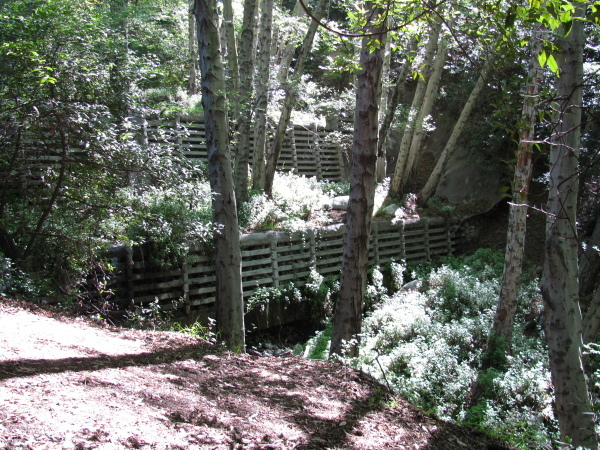 Eventually it came to a dam of odd concrete with a waterfall going down it. Looking down it, we found the water had built up a chute covered in moss. It was actually quite surprisingly beautiful and was the moment I really wished I'd remembered to bring the camera. The trail crossed the stream to find a good way down the dam and from there on it crossed the stream quite freely. The canyon narrowed down a lot and this was the most beautiful part to me. It also became rather challenging to pass. At one time, I found myself totally unable to find a spot to step that didn't leave me slipping into the water. Eventually close examination found a way that wasn't as covered in loose gravel as all the other ways. Another time I found myself with a great need to hold onto something to get by most easily and everything to grab was poison oak. I made it past getting no closer than an inch, which was right in front of my face. Overall, the poison oak wasn't as bad as one might expect. The canyon got narrower and narrower. 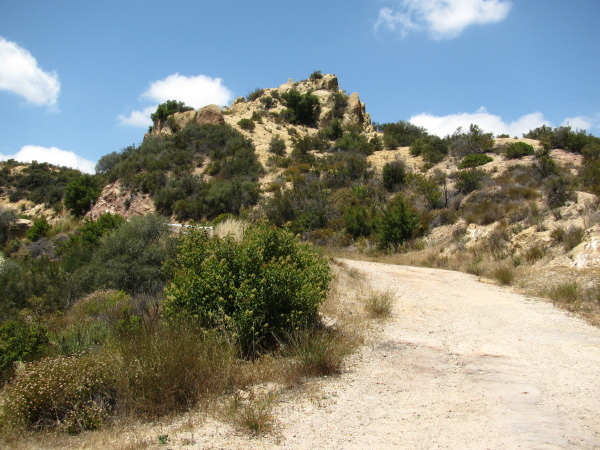 It finally opened up again, a little, as the trail took off up the side with a sign saying "Will Rogers thata way". Just before the end of the canyon, we ran into four kids coming up the other way. The only others we saw in the canyon were walking a dog on the easier part where old roads often can be found. Many many people were going up to Inspiration point (or coming back down) and quite a few were going up to the peak just past the bridge, but none came our way. 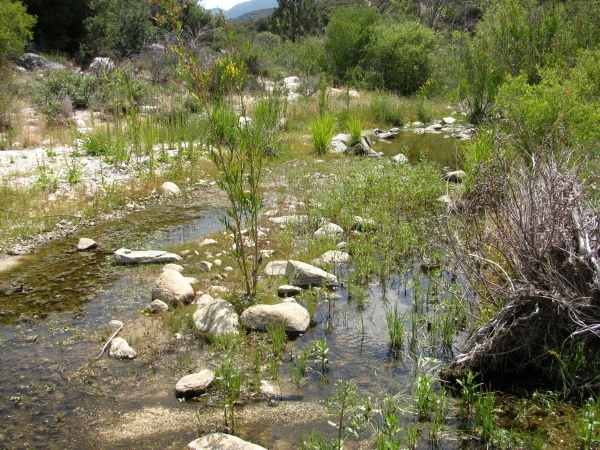 Where there's a creek, there's flood control. Or it seams that way. Sometimes even very large double bits of flood control like this one.